Items in transit are susceptible to damage if not packed, handled and protected carefully. 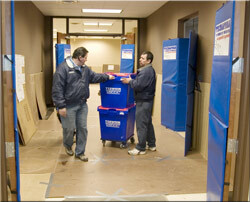 Our office removals staff are industry trained and will protect items in transit. Small and specific items such as technology effects are packed into moving crates or cages after being over-wrapped with antistatic bubble protection roll. Seals can be fitted for further security and protection. For items which will not fit into the office moving crates or cages, which usually comprise of “furniture” items, these will be over-wrapped with “removal transit blankets” which protect against scratching and gouging. Pictures will be protected by placing within bubble bags or bubble envelopes, before over-wrapping with a multi-layer paper blanket and cardboard protection board. A specific protection team will be assigned to handle all aspects of building protection. Office furniture fitters, porters and the relevant materials will arrive on site prior to move activity to carry out all protection work before the move begins. 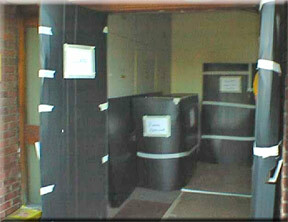 After the move has been completed, all protection will be lifted and removed by removal teams. To meet usual requirements hardboard floor coverings are laid as a matter of course in all walkways and other common areas. In addition these floor coverings are enhanced by the use of metal check plates when receiving surfaces require such protection, i.e. when safes are being moved through a building. In order to ensure that all areas that require protection are identified, each protection phase would begin with a pre-move planning meeting and audit to highlight areas to be protected and to discuss our proposed method for doing so. Identify areas that require floor protection (e.g. hardboard or other suitable material). Fit protection where identified: generally hardboard for floors, vulnerable areas with Correx plastic protection board, doors with purpose-designed quilted door covers and jams. Post-move, remove all protection and clear debris from site. Conduct audit to check effectiveness of protection and obtain approval of standards. 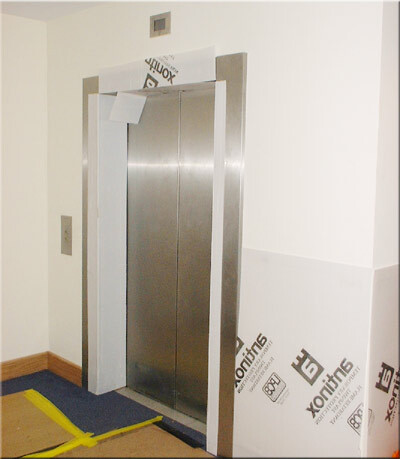 Lift floors will be protected by hardboard sheeting and the interiors with 6mm Impact Correx Board. If lift liners are available removal company will provide any necessary protection to lift interiors which leave any exposed areas. Exterior lift casings and fascia areas will be “faced” with Correx impact board using Lo-tac tape to secure in position. This reception has been protected using Correx (plastic corrugated material) to minimise collision damage. A Hardboard track is laid on the floor to protect the walkway. Both the Correx and Hardboard is held in place either by Lo-tac or Gaffer tape, depending upon the surface to which it is affixed. Rapid protection - easy to fit and quick to remove. Offers high level of protection to building fabrics with nil damage.